A parent of a severe epilepsy sufferer said cannabidiol helped to greatly reduce her seizures. AN OIREACHTAS COMMITTEE on health has heard that the potential benefits of cannabis-based treatments offers a “tantalising new horizon” for epilepsy sufferers. A session this morning on the examination of the merits of the licensing of medical cannabinoids also heard the case of a young girl whose rate of seizures dropped dramatically when treated with a high cannabidiol (CBD) cannabis extract. 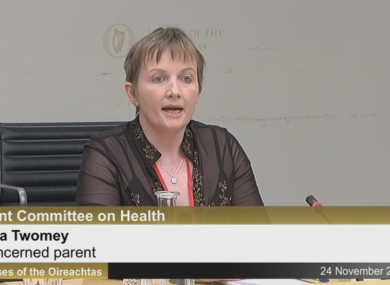 Addressing the committee was consultant neurologist at St James’s Hospital, Dr Colin Doherty, the chief executive of the Health Products Regulatory Authority (HPRA), Lorraine Nolan, and a parent of an epilepsy sufferer, Vera Twomey. Vera began by passing around a photo of her daughter, Ava, who suffers from an extremely rare form of epilepsy called Dravet Syndrome. Vera has petitioned the Minister for Health to take action on the issue, recently pledging to walk from Cork to Dublin to raise awareness for her daughter’s case. Simon Harris said he would look into the matter further, as a result. Ava’s condition was extremely severe, often resulting in multiple seizures of all types each day. With Ava’s conditioning worsening, her family turned to Charlotte’s Web, described as a purer form of cannabis oil with high levels of CBD. CBD has had a profound effect on Ava, but Vera is pushing for access for such treatments to be expanded upon. “We want the very best for Ava. I have seen that this is working. We feel like we can’t talk to our doctor. I’m sure if the doctor could prescribe it, they could be more involved. We want the Government to come forward and help us. Dr Doherty told the committee that there was growing evidence for the efficacy of CBD in cases of epilepsy. While some forms of CBD are available to purchase in Ireland, they are not regulated as a medicine and cannot be prescribed by a doctor. He pointed to forms of CBD currently undergoing clinical trials in epilepsy, such as Epidiolex, which has seen one in ten patients becoming seizure free, as well as a sharp reduction in seizures for half of the people treated with it. Around a third of epilepsy sufferers cannot control their condition, the consultant neurologist said, and “many have reached the end of the line” having tried all available treatments. More scientific evidence would be required before doctors became comfortable prescribing CBD if they were to be approved by regulators, he added. The main barrier to the licensing of medicinal cannabis was described as the lack of clinical evidence of its long-term efficacy, as well as the lack of data on its long-term side effects. The HPRA’s Lorraine Nolan told the committee that a lack of scientific evidence was the “underlying factor” as to why CBD is not yet available as a prescribed medicine. For medicines to be be accessed by patients through their doctors, an assurance of rigorous scientific assessment must be provided. This is not yet the case for many forms of medicinal cannabis. In other parts of the world where medicinal cannabis has been legalised, they have been “demand-led” and necessitated a “relaxation of drug laws”, Nolan said. Doherty agreed, adding that “scientific evidence should not be open to interpretation”. If it was approved by regulators for use in patients without appropriate evidence of long-term safety, doctors may not be willing to prescribe it. “No one wins if something is pushed through that a doctor is not comfortable prescribing,” he said. The presence of the psychoactive THC (tetrahydrocannabinol) in many cannabis extracts is also a worry in terms of medicinal cannabis, because of its side effects. “There are reasons to be optimistic about some anecdotal reporting of CBD effectiveness, but ones with high levels of THC should be worried about,” Doherty pointed out. Nolan also said that the Department of Health had tasked the HPRA with reviewing the availability of authorised medicines containing cannabis and a review of the ongoing clinical research in the area. Their results are expected to be given by the end of January. Speaking at the committee, Anti-Austerity Alliance/People Before Profit TD Gino Kenny discussed a bill to be brought before the Dáil next week, which calls for cannabis use to be permitted for sufferers of illnesses such as Multiple Sclerosis, cancer and Dravet syndrome. “The more I get to know about this medicine, the more I’m fascinated by its medicinal purposes,” he said. “Shockingly, people are criminalised for it. These are ordinary citizens that have been in very difficult circumstances and traditional medicine has not worked for them. They should not be stigmatised. Hopefully the bill which I will put forward will pave the way for medicinal cannabis. Also addressing the committee was Fine Gael TD Kate O’Connell, who is a pharmacist. She indicated that many within the party are quite open to medicinal cannabis coming into effect in Ireland, and that Minister for Health, Simon Harris, was one of them. She did, however, caution against hasty action on the issue. “I’d always be anti-quick authorisation, anti-fast tracking. We’d be giving these to children. We need to be mindful of the side effects,” she added. Read: ‘I found that nothing worked, except cannabis’: Who are Ireland’s marijuana users? Email “'I've seen this work': Mother takes fight for medical cannabis to Leinster House”. Feedback on “'I've seen this work': Mother takes fight for medical cannabis to Leinster House”.